Here's a post for all the nerds out there: Yesterday I got the news that what we thought we knew about the cornea (the clear layer of tissue located on the front of the eye) was actually all wrong. 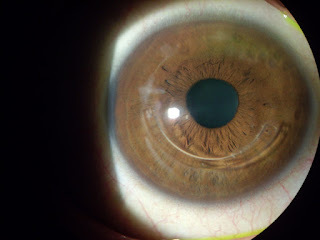 Scientists have a discovered a new layer of corneal tissue, and since the cornea is where many ocular surgeries are performed, this new discovery could have a huge impact on the way we treat corneal diseases and procedures for corneal transplants. is remarkably thin -- only 15 microns in total! But it is incredibly strong, able to withstand a large amount of pressure. Due to its strength, surgical procedures may utilize this area in future as a location to guide laser incisions, preventing damage to weaker corneal layers. With a discovery this new, we have yet to realize the impact on applied science. But we do know that a lot of textbooks will need to be rewritten!